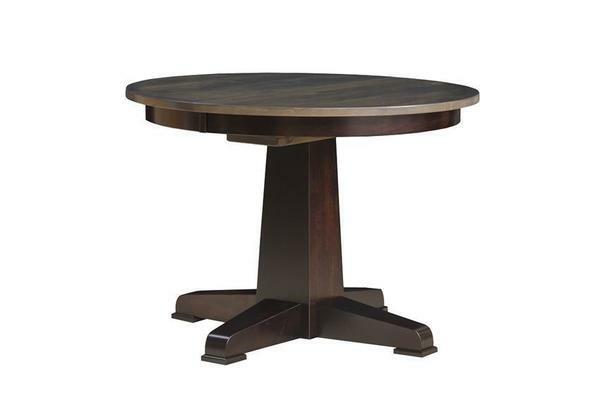 A round table like the Amish La Croix Extending Pedestal Dining Table invites cozy conversation. The round style has everyone seated at the table able to see all the guests. The La Croix has a thick stem rich with solid wood and a four point base. Features a rich, round tabletop. The La Croix is shown here in brown maple wood with popular antiquated slate and ebony stain. The La Croix is Amish made to perform. Delight in this custom made table that comes to your home with the custom options that serve you best. Get in touch today for assistance with your order. Thank you for shopping with DutchCrafters. Some assembly is required on this table.